Steel siding offers a fantastic finished appearance in an extremely durable material. With so many materials available, finding the right siding option can be difficult. At ABC Seamless, we specialize in steel siding installation for residential and commercial properties. Steel siding offers a variety of excellent features that make it the superior siding material for your needs. If you're interested in upgrading your siding, our experts can help. We can evaluate your property, recommend the right siding solutions, and provide you with a quality installation. Call us today at 1-208-939-4314 or click below to get a free estimate on steel siding installation! We offer all our siding services in Eagle, Boise, Nampa and throughout the surrounding areas. This Caldwell homeowner wanted exterior remodeling of house. Decided to have ABC Seamless install seamless siding, fascia, soffit, gutters, window and door wraps. After having experienced a rough winter and wet spring, these Cascade homeowners decided it was time to upgrade the existing protection on their house by upgrading their existing siding to seamless log siding, adding new fascia, and adding wraps to the windows, doors and garage doors. ABC Seamless installed the job to the homeowners satisfaction. These Pine, ID homeowners were looking to find fire resistant siding for their new home. We installed seamless steel log siding. Eagle homeowner wanted new siding on house. Decided to get Seamless Siding on exterior of house. The fascia on this home was old and rotting. Most of it had fallen off and the exterior of the home did not reflect the owner's vision. ABC Seamless was able to tear off the remaining fascia and install brand new, 6 inch, seamless steel fascia. To enhance the look, we also installed a 2 inch beam above as requested by the homeowner. The finished project speaks for itself! Homeowner decided to have exterior of house upgraded for increased protection. 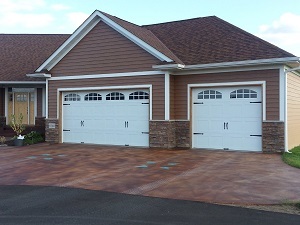 A new door, window and door wraps, and siding were installed to satisfy the owners' request. Homeowners wanted second story exterior updated. Owners decided to have siding and soffit installed. Homeowner wanted to have added protection to exterior of house. Owner decided to have new gutters, window and door wraps, and seamless siding added. The beams on this church were beginning to show their age. ABC Seamless worked closely with board members to choose a color that everyone approved. Our expert installers gave the church a face lift with seamless steel siding, despite the height of the beams. This Boise home had old wood siding that was peeling. We installed new siding, sofftit, fascia and gutters that that don't need to be painted! Homeowner wanted updated exterior protection of house. Seamless siding was installed to satisfy the owner's wishes. This Boise, ID homeowner wanted to upgrade the exterior of their house. They concluded it may add more protection. Seamless steel siding was installed to fulfill owners request. Steel siding is durable, long-lasting and low maintenance unlike vinyl. The homeowner is now satisfied with their newly improved, sleek steel siding! Boise homeowner chose to upgrade exterior of house. Seamless siding, soffit, and windows with window wraps were installed. Our experts will help you choose from a variety of steel siding options to create the look you want. Durability: It's obvious that steel is a naturally stronger material than vinyl or other common materials, which is a big reason why it's a great investment. Steel will hold up against wind, hail, falling branches, and other forms of wear and tear. Steel also offers excellent fire resistance and won't be damaged by insects or rodents. Longevity: You expect your siding to last for the long haul, and steel siding delivers in that department. When properly maintainted to protect against rust, steel siding can last 40 years or even longer, ensuring that you don't need to frequently replace or repair your siding. Low maintenance: Steel siding won't fade over time like vinyl siding will, and you won't need to worry about repainting. Rust is a minor concern that is easily addressed through proper maintenance and the occasional touch-up if the protective finish is ever scratched off. Environmentally friendly: Steel is made from recycled materials and provides excellent insulating qualities, helping you to reduce heating and cooling costs. 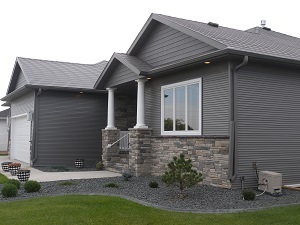 Steel is universally considered to be the most "green" siding product available. ensures you'll maintain your curb appeal over the life of your home. If you're interested in upgrading to steel siding for your home or commercial property, ABC Seamless is here to help. We provide expert steel siding design and installation, and we can help you get the perfect solution for your needs. Call us today at 1-208-939-4314 or contact us online to get your free estimate on siding installation. We offer all our services in Eagle, Boise, Nampa, Caldwell, Meridian, Kuna, Mountain Home, Garden City, Ontario, Oxbox and the nearby areas.